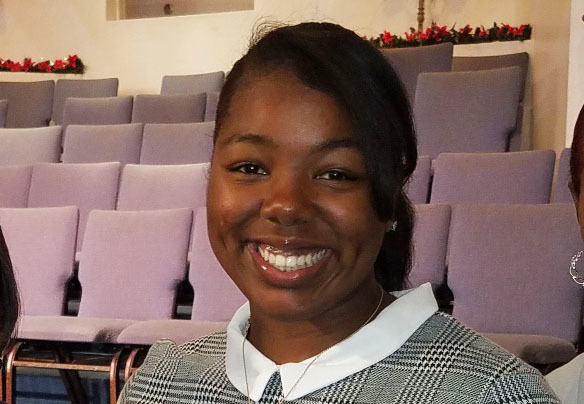 LA PUENTE — Dominique DuPar, a member of St. Stephen Missionary Baptist Church in La Puente, has been selected as an Acteen national panelist. DuPar, 17, a senior at Upland High School, is the first Acteen from California to be selected to the elite six-member panel of some of the top Acteens in the country. Acteens is a missions organization for girls ages 12-17 or in grades 7-12, sponsored by Woman’s Missionary Union of the Southern Baptist Convention. Through Acteens, teenage girls have opportunities to grow in their relationships with God and their peers, learning to look beyond themselves and become actively involved in missions and ministry. National Acteen panelists represent Acteens from across the country. These outstanding young women have exhibited a strong commitment to Christ and to missions through their involvement in Acteens, leadership responsibilities in their church and community, and dedication to their academic studies. Eva De La Rosa, California Southern Baptist Convention WMU director, was notified first that DuPar had been selected to the panel by national WMU. She had the privilege of making the calls to DuPar and Alma Long, Acteen director at St. Stephen. “I was in the bank when I got the call from Miss E (De La Rosa) telling me I had been selected,” DuPar said. “I just started screaming and had to run outside! I was thrilled. DuPar praised Long for helping her achieve the goal. De La Rosa also praised Long for her 20-year career as an Acteen leader. “Alma has invested so much in her Acteens over the years. She challenges the girls to watch for mission opportunities and to step out in faith. “Dominique is very involved in church and school,” she noted. “She loves missions and loves people. People are drawn to her by her enthusiasm, warmth and personality. “She has consistently been involved in all mission activities at the church, plus she has been on local, national and international mission trips,” Long said. DuPar takes seriously her position as the first Acteen from California to be named to the national panel. De La Rosa said DuPar will have multiple opportunities to represent Acteens and California throughout her year on the panel. She and the other panelists will serve at a national WMU event, and at the Southern Baptist Convention annual meeting, in Birmingham, AL June 11-12. Panelists will be featured in a WMU magazine and have a direct avenue to speak to Acteens across the country by writing articles for the Acteen audience. “Dominique will also have the opportunity to speak at churches and mission gatherings and activities up and down California, sharing how being involved in Acteens and missions has helped her grow,” De La Rosa noted. “She will speak at our state convention annual meeting in San Diego this fall. She will go with me to multiple children and youth mission conferences and activities, including Tapestry and the Children’s Missions Day Explosions. She will be a missionary to the children. DuPar will graduate this spring and plans to attend either Cal State Long Beach or Howard University, studying to become a Physician Assistant. Her mission involvement will make a tangible investment in her future with $1,000 scholarships from the WMU Foundation and her church, as well as another scholarship from California WMU. De La Rosa announced DuPar’s selection to members of St. Stephen a few weeks after the notification, presenting her with a certificate and flowers.